The first 2,000 API calls are free (excluding Face LiveDetect). Accurately detects faces to recognize people with different ages, genders, and clothing styles in face verification and VIP identification scenarios. The face verification accuracy in Labeled Faces in the Wild (LFW) exceeds 99.6%. Includes the Face Detection, Verification, and Retrieval sub-services and will open Dynamic Portrait, Age Recognition, and Feature Point Positioning in the future. Supports face retrieval, detection, and verification among numerous images in image libraries. The functions are stable with controllable latency after years of practices. Provides easy-to-use APIs with specific functions and related documents with detailed descriptions. The Face Detection and Verification functions can be used for identity verification in scenarios such as airports and customs where consistency between a certificate and a person must be checked. The recognition algorithms are robust, enabling accurate recognition in complex scenarios. Face Recognition supports millisecond-level recognition of a single face. The Face Detection and Verification functions allow enterprise customers to implement e-attendance of employees and assist them in security surveillance. 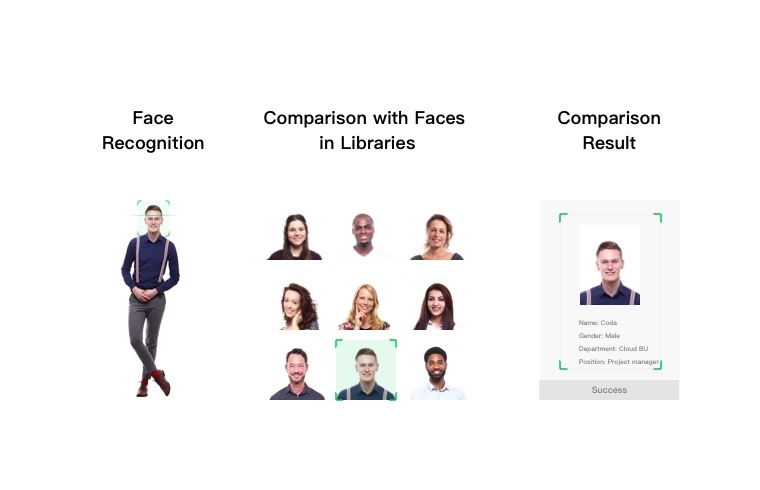 You can obtain the similarity between the face to be detected and a single face in the library in milliseconds. Face Retrieval helps you search for N facial images that are most similar to the input one and displays the similarity degrees. You can perform track analysis based on the information about the returned images. Supports face retrieval by multiple criteria, and import and filtering of facial images with multiple attributes. Supports real-time retrieval. Images can be retrieved after being imported to the library. With face detection, verification, and retrieval technologies, shopping malls can accurately analyze a customer' age and gender and distinguish old and new customers, achieving precise marketing. The recognition algorithms have a low latency and allow you to analyze customer attributes in real time. Face Recognition intelligently and quickly analyzes customer attributes and provides references for marketing strategies. Quickly detects faces in an image and returns their locations. Compares and analyzes the facial features of persons in two images to determine whether they are the same person. Searches the library for N facial images that are most similar to the one you input. (Coming soon) Provides the track analysis capability based on face information. Detects the living figure in a video and the sequence of the figure's actions. Recognizes and groups features of facial images to implement automatic labeling and label-based retrieval.